Despite it being well and truly winter, to prepare ourselves for any potential spice attacks we decided to get some cooling and refreshing drinks: a nimbu pani for my friend and a rosewater and cardamom lassi for me. 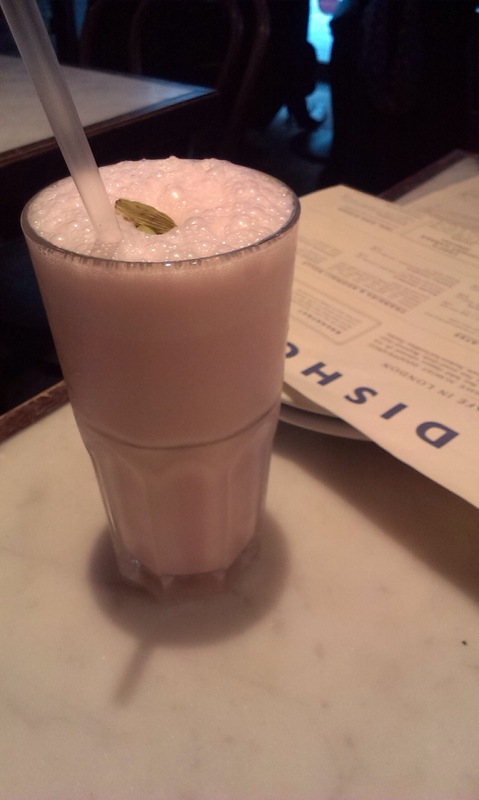 The lassi was light and just the right sweetness with the fragrance of the rosewater. As the most intriguing items on the all day menu seemed to be dotted around the starters section, we opted for a few small dishes to share. 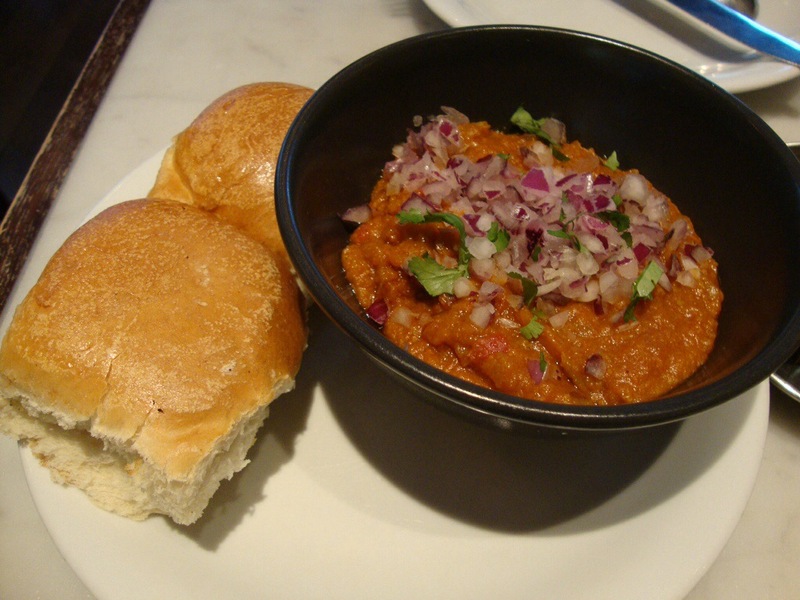 First came the pau bhaji, which was a bowl of mashed vegetables to be enjoyed with the accompanying hot buttered pau buns. It was quite a filling combination as it was heavy in starch, but at the start of the meal this was not too much of a problem, and the flavoursome chunky vegetable and potato mix went well with the soft and fluffy buns. 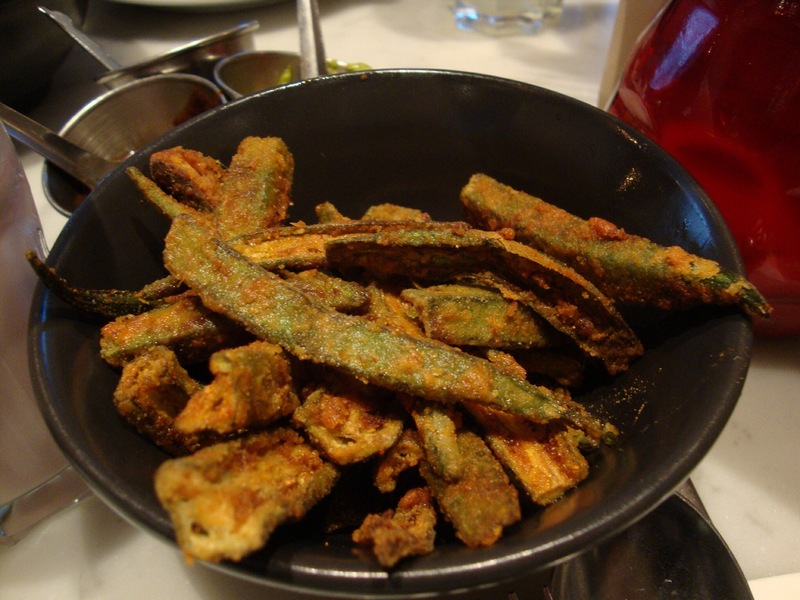 As an interesting alternative to vegetable chips, the okra fries were a success. The texture worked well with the spiced batter and they we’re not overly greasy as can often happen with fried vegetables. Another of the small dishes we tried was the skate cheeks koliwada, which turned out to be fresh and pleasantly springy to the bite, with a distinct citrus kick from the tamarind. The chicken ruby was a simple curry dish, perhaps closest in style to what one would normally expect on their local Indian restaurant menus. My friend wasn’t a fan of the smokey taste of the chicken but for me the balance of spices was just right and the meat was surprisingly tender. As suggested on the menu, the ‘makhani’ sauce was best tasted with a roomali roti, however I did find that the roti was on the rubbery side which was rather disappointing. 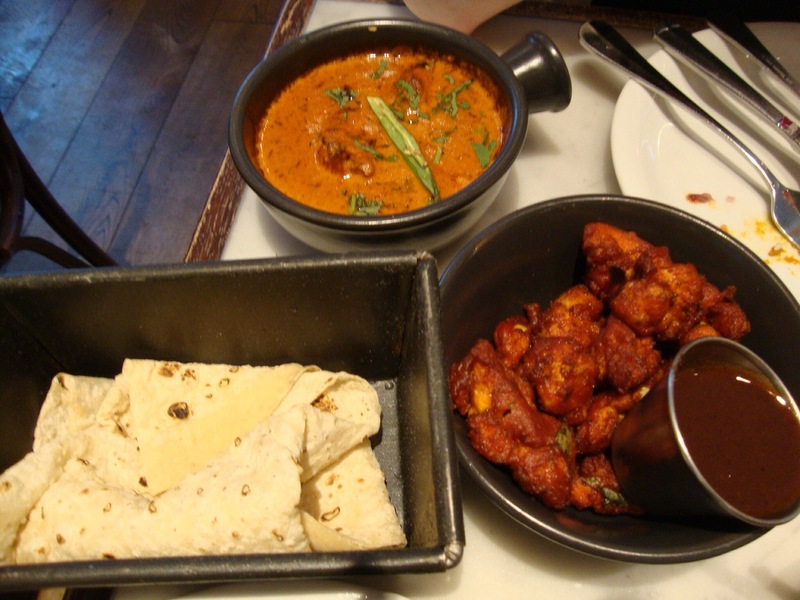 Ultimately I found Dishoom to be a welcome alternative to the typical Indian curry houses that can be found on each and every high street across the country, and I would recommend ordering more of their small plates to experience a wider variety of this ‘South Asian tapas’. Don’t be expecting a thoroughly authentic Indian experience (or any truly spicy fare) here though!